All of our lives, we’ve struggled to become somebody special. We’ve spent much time and money and effort striving to become successful. But when we get there, we find out that we still don’t feel important enough. That’s because we’re measuring our value by the world’s standards, which never satisfies. Apart from God, we are nothing. But in Him and through Him, we are special! We are apostles! He created us with a special purpose in mind. The greatest joy that we can ever receive comes from knowing that to God we are somebody. We never did anything to become important. It’s a free gift, given to us in Baptism and Confirmation. Knowing this will keep us excited every day of our lives. We don’t need to impress anyone. Who could we impress anyway? We never really impress each other. We can’t impress God. Realizing this frees us to be ourselves, because we are already magnificent! We are each a unique, one-of-a-kind, original masterpiece of God. That’s the way He chose to create us. 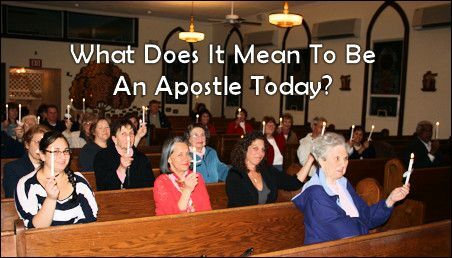 Why Is It So Important to Be Apostolic? This very first sentence is a mind-blower. It shows how much the bishops care about the function we perform as lay people: “In its desire….” They want us partner with them in bringing the Good News of Jesus Christ into the world. They want “to intensify” — stir up, make hot, increase — our “apostolic activity.” In other words, they’re reminding us that we’re part of an apostolic Church and there’s more we should we doing. They tell us in paragraph 3: “From the fact of their union with Christ the head, flows the laymen’s right and duty to be apostles.” As members of the Christian Body, with Christ as our authority and guide, we have been privileged with the right — and commissioned with the duty — of making “all men partakers in redemption and salvation, and through them to establish the right relationship of the entire world to Christ” (paragraph 2). Every Christian is an apostle. Everyone is important. “A member who does not work at the growth of the body to the extent of his possibilities must be considered useless both to the Church and to himself” (paragraph 2). Wow! Useless! God designed us to be important, but we’ve converted ourselves into useless nobodies by doing too little to build up the body and by giving too little of our time and talents. “The only thing that counts is faith expressing itself through love” (Galatians 5:6 NIV). How, really, are we expressing our faith? Are we using every gift and talent and skill to share God’s love as much as we can? Are we using our resources for the growth of the Church? Are we using every opportunity to bring the world into right relationship with God? Think of a time when you were asked to do something and you turned it down because you thought you weren’t qualified. Let’s imagine that a request went out for someone to organize a Bible study for children. You ignored it because you were afraid that you might get in over your head. Your fears were stronger than your love for the children, and that made you useless. When we respond in fear, we’re useless because we underestimate the God who offered us the opportunity to work for Him. We’ve forgotten that He’s powerful enough to help us accomplish the task. If God thinks we can do it, then of course we can do it, as long as we keep in touch with Him and allow Him to function through us. We’re useless whenever we underestimate the God who offered us the opportunity to work for Him. We’re useless when we forget that He’s powerful enough to help us accomplish the task successfully. If God thinks we can do it, then of course we can do it, as long as we keep in touch with Him and allow Him to function through us. When we were Baptized and Confirmed into the Holy Spirit, we became a storehouse of God’s riches. We became a distribution point for God’s grace. The essence of our ministry as apostles is to give to others what we have received from God. Therefore, the bishops tell us in the Decree that we are to put “at the service of others the grace received… as good stewards of God’s varied gifts” (paragraph 3). They base this on 1 Peter 4:10, which says: “Each one should use whatever gift he has received to serve others, faithfully administering God’s grace in its various forms” (NIV). Whatever we’ve received, it first of all came from God so that we could use it to serve others. We are His funnels. As it pours in from God, we pour it out to others. He will never deplete our resources. We can’t possibly be more generous than God is. Being generous means that we give ourselves the opportunity to experience God’s generosity to us. We are apostles. God will provide everything we need to perform our apostolic duties, including the gifts of His Holy Spirit. Each of us has an important mission that is God’s gift to us. He has privileged us to be partners with Him. What Is an Apostolic Activity? “The Church was founded to spread the Kingdom of Christ over all the earth…. Every activity of the Mystical Body with this in view goes by the name of ‘apostolate’” (paragraph 2). In other words, everything we do that glorifies God is an apostolic activity, and the bishops are telling us that they want to intensify this. The Catechism lists many kinds of activities that can be apostolic: our prayers, family and married life, daily work, relaxation of mind and body, and even the hardships of life, “if they are accomplished in the Spirit” (paragraph 901). When our daily activities become spiritual sacrifices, they become holy actions, and by this we consecrate the world to God. See how important you are? 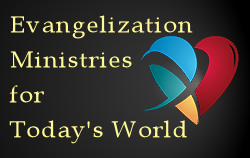 Your everyday apostolic activities are consecrating the world! But what about those activities we keep doing that are not apostolic? Scripture commands us to make sure that everything we do glorifies God. Otherwise it’s useless: “Whatever you do, whether in word or deed, do it all in the name of the Lord Jesus” (Colossians 3:17 NIV). Doing it in the name of Jesus means that we are branches of God’s love, and we are staying attached to the vine, who is Jesus: “I am the true vine…. No branch can bear fruit by itself; it must remain in the vine. Neither can you bear fruit unless you remain in me” (John 15:1,4 NIV). Therefore, all of our activities or deeds that are not apostolic result in no lasting fruit. They’re useless. The bishops wrote: “The fruitfulness of the apostolate of lay people depends on their living union with Christ” (paragraph 4). Jesus said: “Apart from me you can do nothing” (John 15:5). Does the time you spend watching television glorify God? If not, it’s a worthless use of valuable time. Recreational activities can glorify God, for example if they recharge us so we can be enthusiastic in our servanthood, but if they keep us from our apostolate, they can be useless. There are other ways that we wander away from our apostolates. For example, many of us don’t like what’s happening in our parishes so we try to transform them by forcing change — doing it our way. Or we attempt to reshape our children or spouses or others into our image of what we think they should be. By taking matters into our own hands, we are like a branch cut off from the vine. Rather than bear fruit, we wither up, and the so-called fruit that we push onto others leaves a bitter taste in their mouths. 1. We are hidden in God. We do not glorify ourselves. Therefore, the people around us see Jesus, not us. If we’re in a powerful, public role, such as president of the Parish Council, the way we lead teaches others what Jesus is really like. 2. We are free from the slavery of possessions and we accumulate riches that last forever. Materialism does not rule us. We are not servants to our houses that need cleaning or cars that need waxing or electronic gadgets that need a big bank account. 3. We “exert all [our] energies in extending God’s kingdom” and our Christian spirit is an energizing force in the world. Will people remember us as someone who richly affected their lives? Will they recall how we made a difference everywhere we went? 4. In difficult times, we persevere because we “consider that our present sufferings are not worth comparing with the glory that will be revealed in us” (Romans 8:18 NIV). Maybe we’re hurting financially because we have more children than the world says is right, and the mother has given up the needed extra income to stay home to raise them. God’s glory is revealed every time the children show their appreciation by drawing happy pictures with old, broken crayons on the paper from grocery bags. 5. With the love that comes from the prompting of God, we do good to everyone (Galatians 6:10). Our neighbor might be a bad-mouthed grouch, but we mow his lawn and find other ways to serve him. 6. We strive to please God rather than people. Perhaps a friend wants you to join him at a movie that has pornographic elements. When you say no because you don’t want to waste your time and money on a movie like that, he mocks you and calls you a religious fanatic. Nevertheless, you stand your ground because you care more about what God wants you to do. 7. We are always ready to follow Christ, even when it means giving up something or getting persecuted. In other words, we’re willing to carry the cross with Jesus. It’s painful to spend money to fix a neighbor’s broken car, especially when we’d rather buy something for ourselves. What’s worse is when our relatives get mad at us for not using the money on our own family. But we rejoice because, more than ever, we feel the closeness of Jesus. 8. We nurture Christian friendships in which we mutually support each other in all our needs. The way we care for one another (e.g.., “Your need is as important to me as it is to you”) shows the world what God’s love is all about. When Jesus became the Lord of your life, when God became your Father through adoption, and when you were Baptized and Confirmed into the Holy Spirit. You became a storehouse of God’s riches! You became a distribution point for God’s grace! The essence of your ministry as an apostle is giving to others what you have received from God. Everything He has given you — love, mercy, forgiveness, healing, guidance, jobs, money, houses, vehicles, possessions, etc. — came to you through His grace. And it was not for your good alone that He gave you these. The bishops tell us in the Decree that we are to put “at the service of others the grace received… as good stewards of God’s varied gifts” (paragraph 3). They refer to 1 Peter 4:10, which says: “Each one should use whatever gift he has received to serve others, faithfully administering God’s grace in its various forms” (NIV). That’s the definition of generosity. Generosity is a difficult virtue to grasp. We don’t like surrendering what we have. Using the gifts we’ve received means: If we’ve received little, we should not feel ashamed to give little; if we’ve received much, we must not be afraid to give much. We are God’s funnels. As it pours into us from God, we pour it out to others, and He pours it back into us, because He will never deplete our resources. We can’t possibly be more generous than God. Being generous with others means that we give ourselves the opportunity to experience God’s generosity back to us. Of course, we usually feel uncomfortable about being God’s distributors. Our flesh-nature doesn’t believe we can trust God. We’ve got to stop listening to our fears and our feelings; we must respond only to God. If we rely on our own limited perceptions of what we can and cannot do, we live mediocre, unfruitful lives. Apostles Serve Others with Joy! Our apostolate may not be as glamorous as we’d like. It may not be as important-looking. But we must realize that God knows better than we do what’s best for us. Why waste time trying to accomplish a work He’s not assigned to us? Why try to get somebody else’s ministry? Nobody can do their job the way they can. And nobody but you can do the work that God’s called you to do. Each of us has an important mission that is God’s gift to us. He has privileged us to be partners with Him. Sometimes we don’t feel like doing what He asks of us, but that’s where we offer sacrifice. The suffering we experience uncovers new revelations about God and ourselves. We will be blessed by the experience. Whatever we do for the Lord, we should do it with joy, even if it’s scrubbing out potty bowls. Jesus washed the dirty, smelly feet of His disciples. It was a powerful moment of distributing God’s grace. We are not greater than our Master. You, too, must be willing to serve the same ways Jesus served. In doing that, you will discover that you truly are a unique, one-of-a-kind, original masterpiece of the Most High God! Father in heaven, you have created me to be a unique, one-of-a-kind, original masterpiece. When You made me, you called me good. And now You are calling me to serve You as an apostle. In the name of Your Son, Jesus, fill me with the presence of Your Holy Spirit and with the gifts You want me to use. Show me when and how to use these charisms. And help me to get rid of my pride and fears, because my flesh-nature wants to control me. Help me to stay focused on what You are calling me to do. I want to be a pliable instrument in Your hands.